The Boys & Girls Club of East Aurora Alumni & Friends Club supports the Club's mission of "Enabling young people, especially those that need us most, to reach their full potential asproductive, caring and responsible citizens"
by providing support for programs and projects at the Boys & Girls Club. 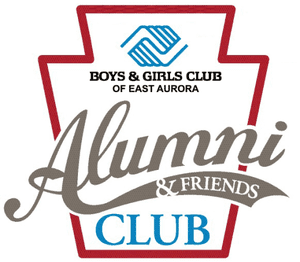 The Alumni & Friends Club invites you to join today to connect with former friends, participate in social and fundraising events, learn of upcoming Club activities and share stories of how the Boys & Girls Club of EA made a difference in your life. All memberships run from January - December. Membership and dues for 2019 calendar year due now! General Membership - Free! Pay for social events at the door. Classic Level - $50* - includes 12 month membership; re-connect to the Club and Camp friends; Invitations to all Club events; discounts on Club and Camp shirts, sweatshirts, etc. ; Club updates through social media, e-mail, newsletters and publications. Plus free entry into Alumni & Friends social events and an annual membership card. (Alumni shirt, jacket or pullover). Junior Membership - Free for all 18-23 year olds. Spouse Discount - 50% off your Classic or Leadership level for your spouse. *Your membership dues help to sustain Alumni operations and other Alumni events. Fill out the form below to become a member. Submit your registration and then either mail or submit your check to the Club at 24 Paine St, East Aurora, NY 14052, pay via paypal on the link below. JOIN US ON FACEBOOK! Click Here!